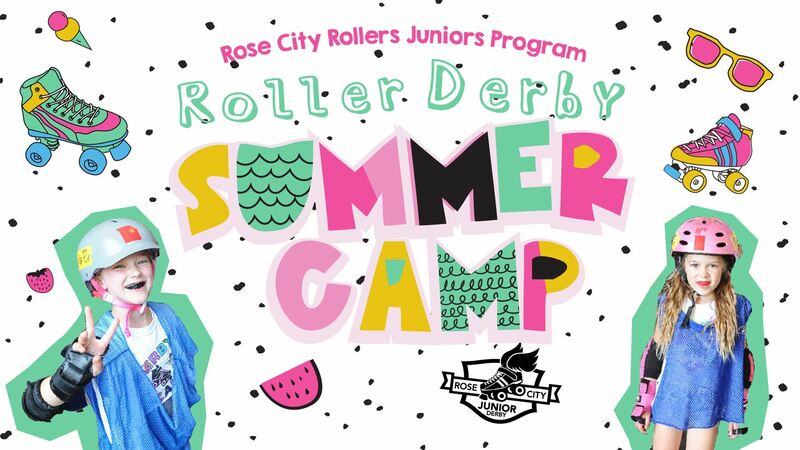 Join us on the track for a week of Junior Roller Derby Summer Camp! This camp is open to youth skaters ages 7-12, of all genders and all skill levels. In this camp, skaters will be divided up by skill level - to have the most fun and make the most of the time they have with us. Skaters in the developing group will learn the basics of skating and roller derby (stopping, falling, blocking), while higher skilled campers will learn rules, strategy and high level game play. Week 1: June 24 - June 29, 2018 from 9am - 3pm, $325 for non-RCR members and $300 for current RCR members. Campers will spend part of the day on skates and part of the day doing off-skates activities like yoga, arts and crafts, strength building and strategy chats. Lunch and snacks provided! *Limited scholarships are available as well as sibling discounts, please email summercamp@rosecityrollers.com for more information. Cancellation policy: We will provide a full refund if registration is cancelled by June 21st, 2019. No refunds past that date.